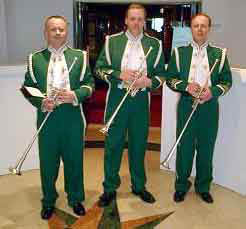 The Trumpeters of London will add musical majesty to your dignified occasion. Using long silver clarion trumpets, they will play from their large selection of sparkling fanfares to herald your VIPs and draw maximum attention to your function's significant events. 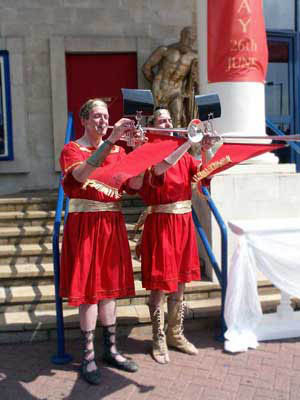 The Trumpeters of London will add musical majesty to your dignified occasion. Using long silver clarion trumpets, they will play from their large selection of sparkling fanfares to herald your VIPs and draw maximum attention to your function’s significant events. The group uses the finest players from London’s orchestral profession. The standard of musicianship is unquestionably excellent, and so is the synchronised visual presentation. Any size of ensemble from a soloist to a ten-piece group is available, and the long ceremonial trumpets (3 of which are actually trombone pitched) can be further augmented with timpani and percussion for an even more dazzling sound. The Trumpeters of London typically play fanfares at presentations, banquets, weddings (services and receptions), product launches, sporting events, church services, opening ceremonies, film premieres, award ceremonies and all sorts of corporate entertainment events…in fact anywhere that requires a spectacular flash of musical brilliance. 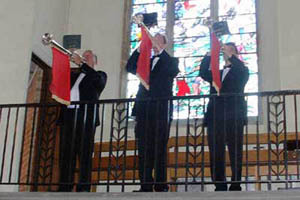 In addition to playing attention-grabbing fanfares the group also functions as a top-class brass quintet, using conventional brass instruments to play a selection of light classical “background music” for receptions and dinners. It has proved popular with the City of London’s liveried companies and guilds in this dual role. The “Posthorn Gallop”, which is often requested for these functions, has become something of a trademark! Several dignified costumes are available to match the tone of your event. We can offer evening dress tails, white or black dinner jackets, lounge suits and our own distinctive green uniforms. The players are also happy to wear any costumes you provide for special “themed” events, and we will make sure the fanfares are in the correct musical style too! “Thank you for getting our Royal Jubilee Celebrations off to such a spectacular start” Martin Stratton, Head of Security and Events, Battersea Park. “When I heard that wonderful sound my nerves vanished, and I felt like royalty as I walked down the aisle. Thank you for such a fabulous start to a perfect day” Sue Banks, wedding client, Basingstoke.